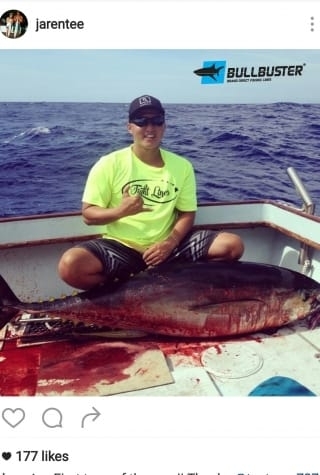 I feel fortunate that in my home state of Hawaii, there are many different fishing styles and techniques to choose from. One of my favorite styles of fishing is called slide baiting. 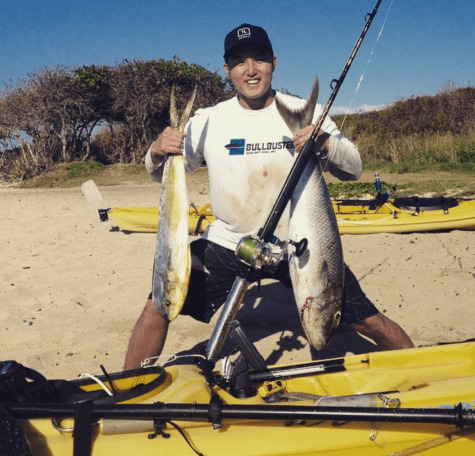 It is done from the shoreline and the target fish is called ulua or giant trevally. Ulua can grow to weights in excess of 100 pounds and are considered to be the "king of the reef" in Hawaiian waters. They fight like crazy and use their intelligence to gain the upper hand in the fight. The terrain that slide baiting is usually done from are rocky cliffs 10-60 feet high above water that is 60-80 feet deep. The underwater topography is also very rugged with sharp reef and coral heads along the bottom. Ulua are famous for running close to these structures in an attempt to cut your fishing line and swim free. 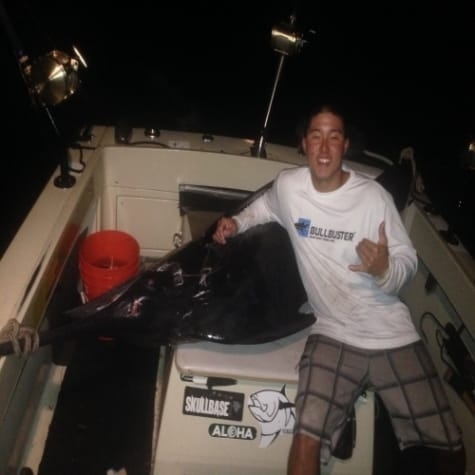 The crew sets up for a great night of Ulua Fishing! Due to their strength and rugged terrain they inhabit, our mainline is usually 80 pound test monofilament. 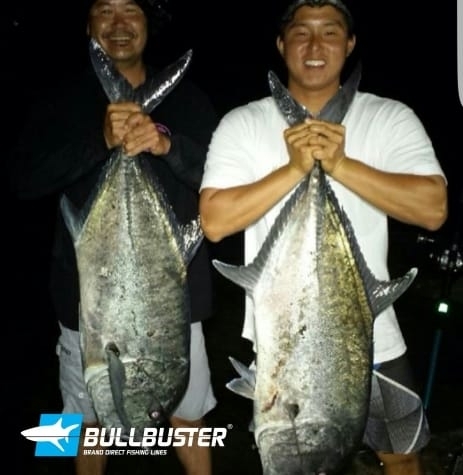 It is very important that you use a line that has high abrasion resistance to increase your success in this style of fishing. 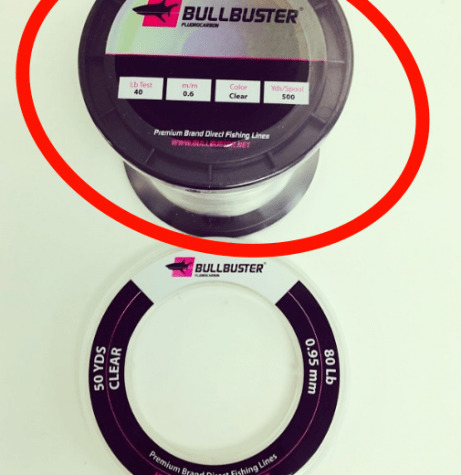 Fortunately Bullbuster premium monofilament provides me with a product that I can have full confidence in to land trophy fish. 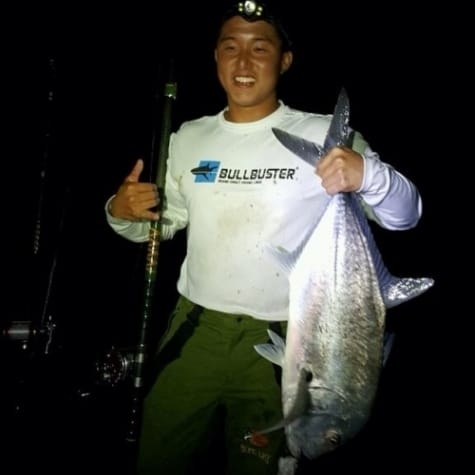 "I started to feel my line rubbing on the sharp reef"
During a recent shoreline outing to one of my favorite spots, my line was tested to the limit and Bullbuster once again increased my success. It was around 10 pm when I heard the familiar sound of my ratchet as my pole bent over and line peeled from the reel. 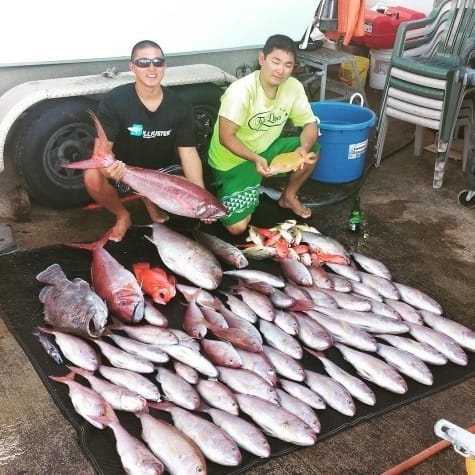 "I patiently waited for another 10 minutes while my line "see-sawed" on the reef"
As I picked up the pole and set the hook, the fish responded with a couple of hard runs and I could tell it was a good sized fish. The fight was nearing the 10 minute mark when I started to feel my line rubbing on the sharp reef. It is a feeling every fishermen dreads but I knew my line would hold until the fish swam the opposite way to pop the line from the reef. Our Tako (Octopus) lined up ready to become Ulua candy! I patiently waited for another 10 minutes while my line "see-sawed" on the reef until I felt the line come free. Once free I put maximum pressure on the fish with each boost to bring it to the surface. I soon had a nice 43# ulua on the rocks. Upon closer inspection of my mainline I found it to be severely chafed but still very strong. I couldn't have landed this fish without such a reliable brand of fishing lines. 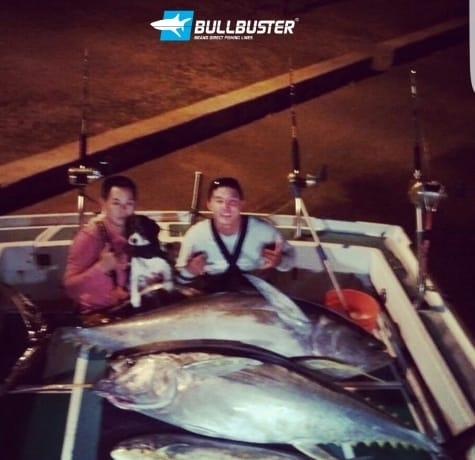 Mahalo once again Bullbuster! Aloha. 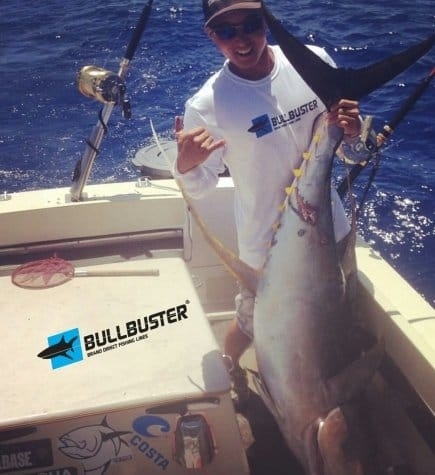 We hope that you enjoyed this article by #BullbusterAmbassador Jaren Luke. It is our goal to help you spend more time fishing. 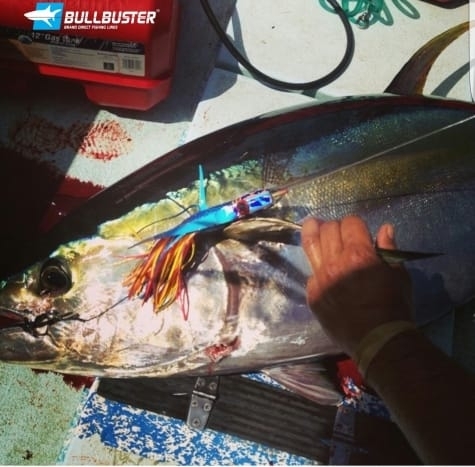 Get a hold of our brand direct fishing lines to get started! 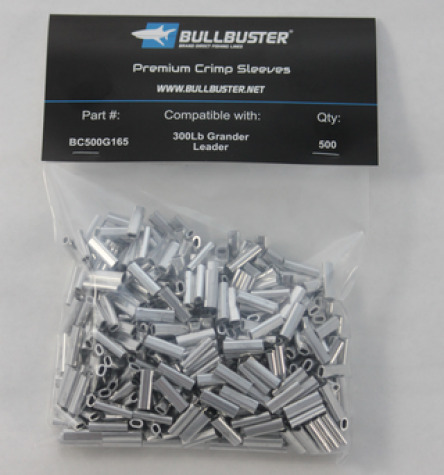 How To How To Crimp Properly Properly - This article covers proper crimping technique. 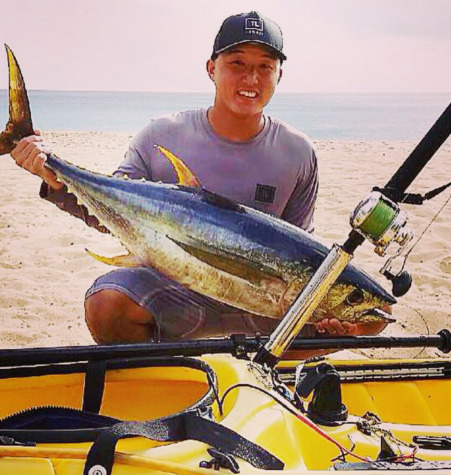 Make Your Own News (Make Your Own News (Hawaii Fishing) Fishing)- A great day of ahi fishing is interrupted by a BIG pacific blue marlin. We were not complaining. Why Getting Your Fluorocarbon In Bulk Can Help You Spend More Time Fishing - One way to get ready for an intense season of spring fishing is to pre rig leaders. 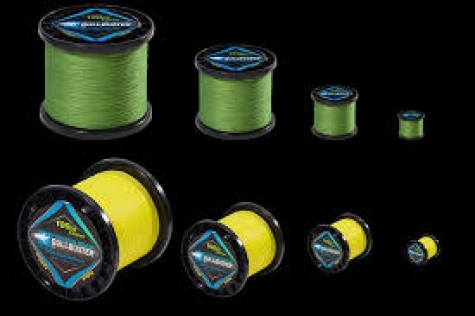 If you are a series fisherman get a bulk spool of fluorocarbon and get tying! A 50 yard skein is going to be a waste of time. Get out a box of ziplock and a sharpie and get rigging! Why Buying Braid In Bulk Can Help You Spend More Time Fishing - We all know braid is more expensive than mono but it also lasts a whole lot longer. When you buy your braid in bulk you get economies of scale but thats not it! You actually end up saving yourself a heck of a lot of time re-spooling when you use it as backing and only replace your mono topshot. If you are serious fishermen, this is the way to go. 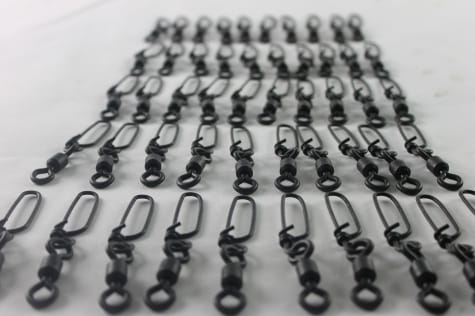 Getting Your Swivels In Bulk Packs Can Help You Spend More Time Fishing - Again it all comes down to preparation. Get a bulk pack of swivels and keep on box on your boat or travel case, and keep the other pack safely tucked away in your fishing closet to avoid any corrosion.